Among executives in the accounting and finance firms, creating and implementing a relevant differentiation strategy continues to be a struggle—however, this does not have to be the case. At its simplest, creating and implementing a differentiation strategy is a five-step process. In this article, Dr. Frederiksen describes these steps. Among executives in the accounting and finance firms, creating and implementing a relevant differentiation strategy continues to be a struggle—however, this does not have to be the case. At its simplest, creating and implementing a differentiation strategy is a five-step process. 1. Begin by deciding exactly which qualities you want to be known for. What are your areas of expertise? Your field of expertise (or other differentiator) needs to be both enduring and relevant to your clients. So, it needs to be somewhat broad. On the other hand, the more specialized your area of expertise, the easier a job you will have of making it visible and defending it against competitors. 2. Start digging into research. Conducting research gives you the insights you need to align your firm’s offerings with potential clients’ desires and preferences. Research will also help you select which issues to write about to make your expertise more visible to your audience. At Hinge, we have found that those firms that conduct research on their target clients tend to grow faster. This is especially true for the fastest-growing firms (those growing at least 20% year over year), which are two times more likely to conduct research than their peers who are not growing at all. 3. Identify your differentiators and set your focus. This may be the most difficult step: zeroing in on the qualities that both set you apart from the competition and that your target clients find valuable. Make a list of potential differentiators and see if they can pass this three-step test. This may sound obvious, but you cannot just make up what sets you apart. For one thing, it is easy for people to spot exaggerated claims. Whatever differentiator you land on, your firm must live it each day, and deliver on your promise. If what you claim makes you distinct does not seem valuable to your prospects, it will not bring you new business. The most important differentiators are those that factor into prospects’ selection criteria and decision-making. Any other differentiators that fail to pass this test are irrelevant, and essentially a wasted effort. Can you prove your differentiator? This tends to be the hardest test of all. You may have found a point of distinction that is both true and relevant, but without proof, it is useless. Even when a differentiator is true, if it cannot be backed up with evidence, buyers will not believe it. Finding a trait that can pass all three tests is not easy—but exactly that is what makes it so powerful. Of course, if you can manage to come up with three to five differentiators, great. But even one strong one can be plenty. Regardless of how many differentiators you have, you will need a focus that, along with the supporting differentiators, will lay the groundwork for your positioning statement. Your positioning statement should be a brief description of what your firm does, who it serves, and why prospects should choose you. Some people refer to a positioning statement as the “DNA” of your differentiation strategy. The next step is to tell your story to your target audience. Because most prospective clients start by checking out your website, that is a great place to start. Remember: first impressions matter, especially when you are helping visitors decide whether you are the firm for them. But your website is only the first place to share your story. You also need to make your all-important expertise visible to the outside world. There are a variety of ways to do so, ranging from publications and speaking engagements to webinars, workshops, video, and more. You also you need a plan to turn your strategy into reality—and then build the tools that will help you make that plan happen. 5. Tell your story (including your differentiators) to the world. 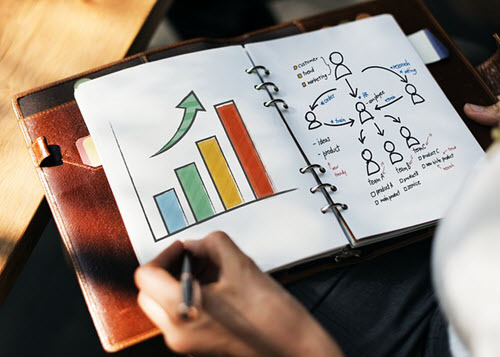 Once you have completed steps one through four, it is time to implement your plan, and tell the story of your firm to the world or, more accurately, your target audiences. Monitor how your efforts are working. Also, track new business activity in your pipeline—and test and adjust your message accordingly. Each time you make results-driven adjustments, your messaging will get better…and your brand will get stronger as well. Differentiation is not easy and takes time and effort. However, because all firms face essentially the same hurdle, it provides an opportunity for those that do the necessary work. The effects do not happen overnight, but our research shows that firms that do invest the time and resources into coming up with and implementing a plan for differentiation will start seeing positive results—often within a matter of months. For more information on this topic, check out our upcoming course, Differentiation, Positioning and Messaging, specially priced for NACVA members.